These trowels are hardened and spring tempered for rigidity and flexibily they also have a plastic end cap for tamping down bricks without damaging them. These trowels are solid forged steel and a taper ground blade for progressive flexibility limited quantity available ONCE THEY'RE GONE THERE GONE. Trowel blade made with quality steel. 3 Trowels spear & jackson Mortar master. 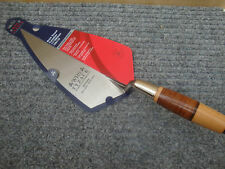 Pointing Trowel 153mm (6"). 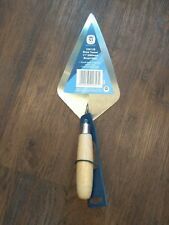 SPEAR AND JACKSON WHS TYZACK 108 11" BRICK TROWEL. For use with bricklayer’s lines to ensure that brick and blocks are laid out in a straight line. CANADIAN DESIGN WITH A HIGH LIFT EXTRA LONG LEATHER BOUND WOODEN HANDLE. 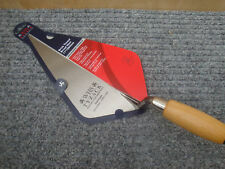 SPEAR AND JACKSON WHS TYZACK 101 11" BRICK TROWEL. For use with bricklayer’s lines to ensure that brick and blocks are laid out in a straight line. SOLID FORGED AND TAPER GROUND BLADE. SPEAR AND JACKSON WHS TYZACK 101 12" BRICK TROWEL. For use with bricklayer’s lines to ensure that brick and blocks are laid out in a straight line. SOLID FORGED AND TAPER GROUND BLADE. • Lightweight and easy to use. Solid forged blade and tang. Hardened edge for cutting bricks. Fitted with a through tang capped handle. - images are for illustration purposes only. View this range. Further Information. Fluid Power. • Wooden handle. • Tang strongly welded to blade. • Strong steel ferrule. • High lift tang for knuckle clearance. Brick trowels X 3. Condition is New. 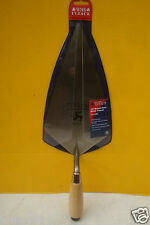 Spear & Jackson Broad Heel Brick Trowel 10"
Tang strongly welded to blade for toughness. Size - 250mm (10""). - Protective lacquer to inhibit rust. TYZACK Brickwork Tools. By expertly bringing together advanced technology the best design and a genuine commitment to total quality TYZACK offers a comprehensive range of superb pointing and brickwork trowels. TYZACK Brickwork Tools by expertly bringing together advanced technology the best design and a genuine commitment to total quality TYZACK offers a comprehensive range of superb pointing and brickwork trowels. The Spear and Jackson 11 Broad Heel Brick Trowel is aimed at the professional who uses a brick trowel on an occasional basis or the serious amateur user/DIY enthusiast. The Spear and Jackson 11" Philadelphia Pattern Brick Trowel has been redesigned and re launched and is aimed at the professional who uses a brick trowel on an occasional basis or the serious amateur user/DIY enthusiast. Spear & Jackson Brick Trowel with Wooden Handle 10"
Wooden handle. - Tang strongly welded to blade. - Strong steel ferrule. Size - 250mm 10". -. Spear and Jackson Brickwork Tools by expertly bringing together advanced technology the best design and a genuine commitment to total quality offers a comprehensive range of superb pointing and brickwork trowels. Spear & Jackson Philadelphia Brick Trowel 11"
Tang strongly welded to blade. - Strong steel ferrule. Size - 280mm (11""). - High lift tang for knuckle clearance. Features & Benefits. The soft feel handle allows for greater comfort during use and is finished with a plastic end cap for tapping down. This does not affect your statutory rights. Taper ground for progressive flexibility. Soft feel handle with integral finger guard. Solid forged blade. Plastic end cap for tapping down. This does not affect statutory rights. Genuine Spear & Jackson product. Spear & Jackson 10811SF-08 Tyzack Philadelphia Brick Trowel, 11-inch. The soft feel handle allows for greater comfort during use and is finished with a plastic end cap for tapping down. This does not affect your statutory rights. Spear & Jackson 10811SF-08 Tyzack Philadelphia Brick Trowel, 11-inch . The blade has bee, hardened, spring tempered and taper ground for progressive flexibility which provides the right balance between rigidity and flexibility. This does not affect statutory rights. We are only happy if you are happy. Handle - Short Wood, Capped. - No handle twist due to a specially shaped tang. Soild Forged Blade. - Taper ground blade for progressive flexibility. Short wood handle. - Solid forged single piece of quality carbon steel for ultimate strength and long life.